Dr. Aradhna Saxena, MD is a Doctor primarily located in Fort Washington, PA. She has 17 years of experience. Her specialties include Dermatology. She speaks English. Dr. Saxena has received 8 awards. The overall average patient rating of Dr. Aradhna Saxena is Great. Dr. Aradhna Saxena has been rated by 26 patients. From those 26 patients 8 of those left a comment along with their rating. The overall rating for Dr. Aradhna Saxena is 4.3 of 5.0 stars. Finance manager requires immediate payment or cash only. Not helpful or considerate with aged patients on Social Security. Dear Patient, We would be happy to address your specific concerns Please give us a call at your earliest convenience. Thank you. Was scared at my first diagnosis of skin cancer. Her and her staff thoroughly explained to me what MOHS (spelling?) surgery was before operating on me. I felt very relaxed and decided to go ahead with the surgery. I am happy I did! After one try, they removed the cancer and left with a great unnoticeable scar. I would recommend my friends in my retirement community. Took the time to explain my condition. Did a wonderful job. Would definitely go back! Office staff was very experienced. Had Mohs surgery 3 times and each time a success and pleasant experience. As soon as you enter the office, the staff and assistants are very kind and warm. Dr. Saxena took the time to explain the Mohs procedure and gave very good aftercare instructions. The outcome was fantastic and I am left with barely visible scars. If , (hopefully not) I had to have the Mohs procedure done again, I would definitely go back to Dr. Saxena. Dr. Saxena has received extensive training in the areas of Mohs skin cancer surgery and Melanoma surgery. Her special area of interest is the diagnosis and treatment of skin cancers and subsequent reconstruction of surgical wounds. Dr. Saxena also has received extensive training in facial rejuvenation and has a great deal of experience administering minimally invasive treatments such as Botox©, various dermal fillers, sclerotherapy, and microneedling / collagen induction therapy with platelet-rich plasma (PRP). 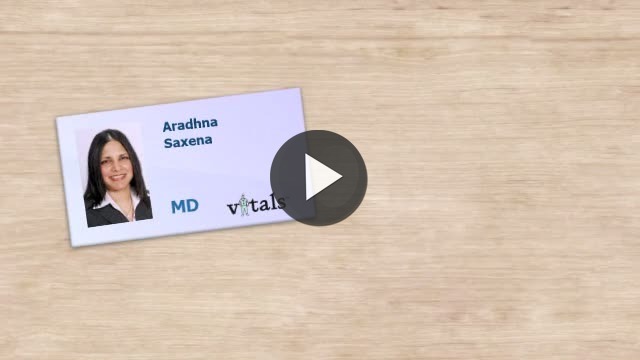 Take a minute to learn about Dr. Aradhna Saxena, MD - Dermatology in Fort Washington, PA, in this video.